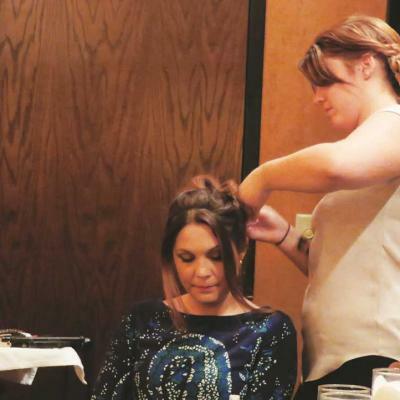 The team at Mitchell’s Salon and Day Spa has been making the people of Greater Cincinnati beautiful for over 30 years, so they know what they’re talking about when it comes to hair and makeup. Luckily for us, they’re willing to share that knowledge by way of Bridal Socials, a series that shows off the latest beauty trends for brides to be. Schedule a hair and makeup trial 3-6 weeks prior to your wedding, and sit down with your stylists for a consultation before your trial. Book your actual wedding day services as far in advance as possible—dates (especially Saturdays) fill up fast! Be realistic about how much makeup you’re willing to wear. If you’re undecided about the look you want, the Picture Perfect package allows you to try multiple hairstyles, test airbrush and regular foundation, etc. Take care of your skin. Makeup can cover tone, not texture, so ask your consultants to recommend a skin care regimen that will work for you. Come to your trial with a clean and moisturized face (no makeup), and wash your hair the day prior. Your hair stylist and makeup artist will take notes and photos for reference during your trial, but it’s a good idea to take selfies throughout the day so you can see how you look in different types of light. You’ll also want to take note of whether everything stays in place (is your eye shadow sliding off?) so you can let your consultant know. If you wax, wax the Wednesday before your wedding. Book your facial at least one week prior to the big day to allow any potential irritation to fade. Get a trim or cut a few weeks prior to your wedding get rid of any straggly ends. Highlights—even subtle ones—will accentuate your hairstyle. Try adding a few pieces 1-2 shades lighter than your natural color to add depth and movement. Do this prior to wedding day just in case. Bring a photo of your dress so your stylist can see the neckline, embellishments, etc. and recommend the best hairstyle to show off you and your dress. It’s easier to cancel services than it is to add them, so book an appointment for everyone who might need a service. If it changes, let the salon know in advance and they’ll send an updated schedule. The hairstylist creates a pretty updo. Book your beauty services 2-3 hours prior to the time the photographer needs you. Remember, the bride gets done last. Covering tattoos requires a lot of makeup, and makeup can get on your dress. In many cases, it might be best to leave it alone—there’s a good chance grandma will be so happy to see you happy that she won’t even notice. The day of your wedding, bring gloss, a lip pencil, and pressed powder or bronzer for touchups. 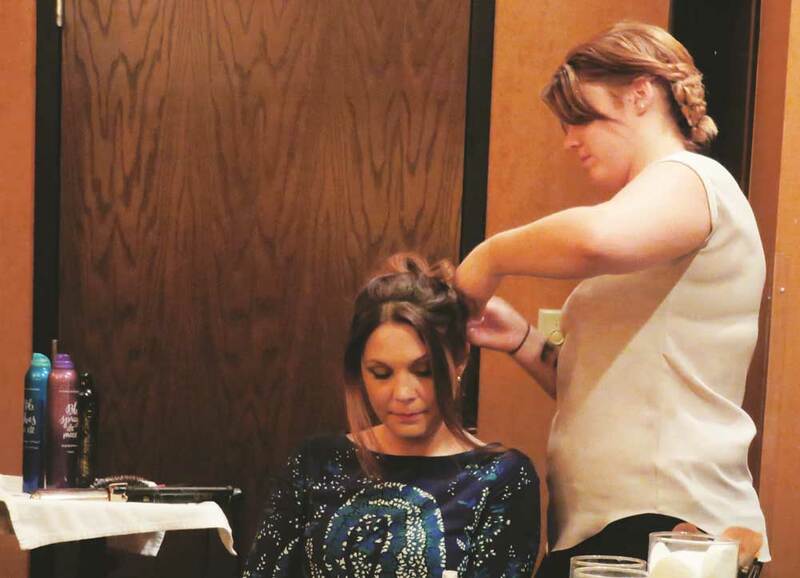 Makeup artists typically don’t stay for the ceremony, though they can be booked for an additional hourly fee. If you have oily hair, wash your hair the night before the wedding. If you’re wearing an updo that needs more hold, go for second-day hair. Current hair trends are slightly undone, like bohemian braids, waterfall braids, loose buns, and unstructured topknots. On site services typically take four hours for party of 4-6. Each stylist comes with an assistant to prep everyone. Hair styling usually involves a LOT of hairspray. If you’re on location, set up the hair station away from any open food, drape any delicate furniture, and make sure there are enough outlets and seating. In-salon services are always faster and more efficient, but you should get dressed at the venue. Wear clothing that you don’t have to pull over your head to take off, like a button down shirt. If you have an especially large party, go to the salon so everyone can get their services done at the same time.